If you follow this blog you know that I always had a soft spot for cauliflower. It ranks up there as one of my favorite veggies to cook with - it lends well to so many different flavours, and is similar to rice in that it is a blank canvas for any meal. As an avid cauliflower lover, I have cooked it a million different ways but cauliflower fritters hold a special place in my heart. Especially my Parmesan Cauliflower Fritters. I used to make ‘em as a side dish, but they are so delicious and satisfying that nowadays I serve them as a main. Vegetarians and non-vegetarians love them equally. 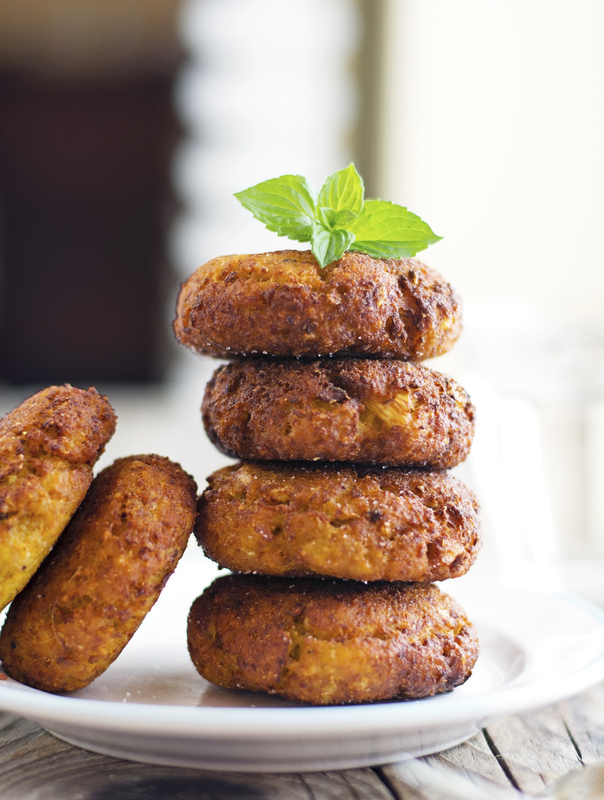 Today I’m sharing a new recipe for cauliflower fritters. The process is completely different from the parm cauli fritters, in that there’s no cooking in the microwave and especially no squeezing the water out of the cauliflower. Instead, the cauliflower is roasted in the oven, then chopped and finally combined with the other ingredients. Roasting the cauliflower brings out the best in this versatile vegetable, giving it a caramelized nuttiness that works beautifully with spices: curry powder, cumin, and turmeric. I usually combine cauliflower with milder flavors, but this time the result is pure deliciousness. I love these fritters, nieces and nephew love them, sis LOVES them. Crunchy on the outside, creamy on the inside, and packed with flavor. What’s there not to love? This recipe is a winner in my opinion, and I’m pretty sure it will become my go-to recipe for cauliflower fritters in the future. 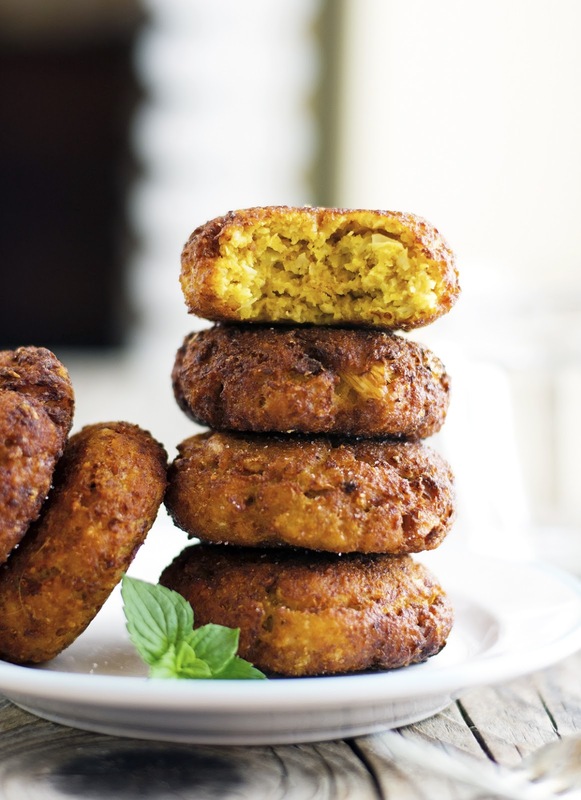 These Curried Cauliflower Fritters make a great quick healthy meal for the family but they’re also fancy enough to serve to company. They have a Middle-Eastern flair that makes them so very special and are so yummy and delectable that they’re impossible to resist. As a dipping sauce, I like to use my Lemon Yogurt Sauce but nephew love ‘em with Sriracha Ketchup. I’ll let you decide on this one. Curried Cauliflower Fritters Print this recipe! Place cauliflower florets on a large baking sheet and drizzle with olive oil, sprinkle with salt, and toss so that it’s evenly coated. Bake for 20 minutes, turning once at halfway to ensure even roasting. Remove from the oven and transfer to the bowl of a food processor. Pulse until completely chopped. Transfer chopped cauliflower to a large bowl and add breadcrumbs, eggs, flour, Greek yogurt, spices, and ¼ teaspoon of salt. Mix thoroughly until combined. Cover and refrigerate for at least 1 hour. If the mixture is too 'sloppy', add more breadcrumbs or cornstarch/flour. You should be able to easily shape the fritters without making a sticky mess. If instead the mixture is a bit dry, add a bit of water, one tablespoon at a time. Scoop 2 heaping tablespoons of cauliflower mixture and with dampened hands form into patties about ¾-inch thick. Place a skillet over medium-high heat, pour in vegetable oil until it reaches ½-inch up the sides. Once the oil is hot fry patties in batches for about 2 minutes per side, until golden brown. Transfer to a plate lined with paper towels to drain. Keep warm in the oven while frying the remaining patties. Serve with Lemon Yogurt Sauce or with Sriracha Ketchup. These look so crispy and addicting! I have a soft spot for cauliflower, too..definitely going to try these asap!